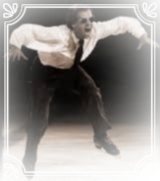 Gary would like to be a good role model and inspire skaters and spectators as legendary figure skater. He has continued to perform and compete for more than half a century to develop mastery through theoretical and experimental research, discovering and exploring by scientific method based on physics, vitality, and training output. Emphasis on fundamentals of sport and figure skating. Off-ice lifestyle for health and fitness.